Amongst my field gear is a buzz off shirt, hat, and bandana that were purchased in Alaska to ward off the state bird – the mosquito. Upon arriving to Fairbanks, I realized within the space of a few days that I would need some better bug gear for my tenure there and found a local store stocked with an entire floor of their store featuring buzz off gear. Ex Officio definitely has a style that carries over into their bug gear, making it a cross between travel gear and classic field clothes. I kind of wish they had included their travel pockets in the shirt, for instance. But they’ve included the buzz off chemical, whatever that may be, into their quick-dry cloth, meaning that you can wash and wear while traveling.I’ve gotten the most use out of the hat, which has since traveled with me to Costa Rica, California, and to work on a farm, among other things. It’s light fabric isn’t too warm to cover my head and it’s just the right brim size to prevent sun in my eyes without blowing away. I’ve heard the mere presence of a bucket hat also has the effect of repelling bugs, but this one has the added benefit of being a buzz-off. 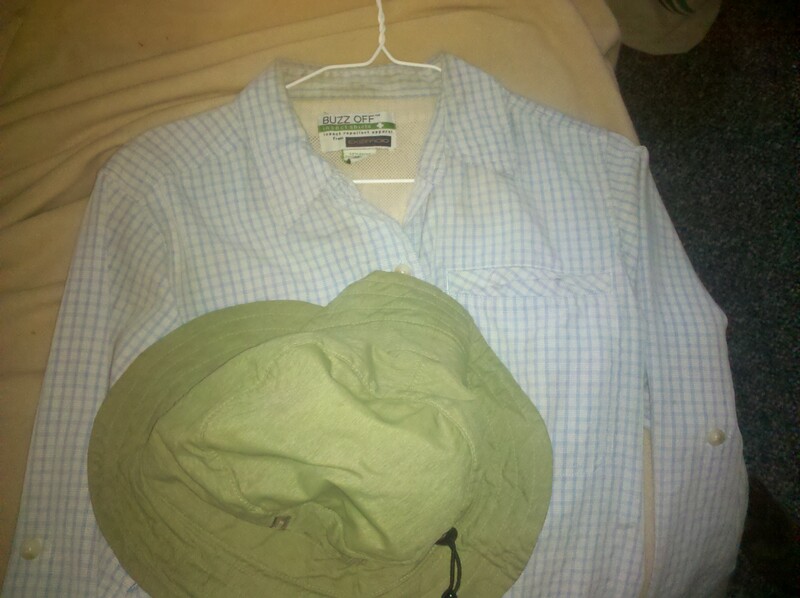 The shirt and the hat have both surpassed their 25 wash lifespan as a buzz-off fabric and they’ve continued to work well to keep the bugs away. I can’t tell if that’s because the 25 washes was a conservative estimate or because the clothing is also well-designed to keep the bugs out. I’m guessing it’s a little of both, which makes them worth considering for long-term use as well. Utility: 4. They’re great in design and appear to be effective at keeping the bugs at bay. Durability: 2 and 4. Their 25 wash limit on the buzz-off effectiveness is a bit limiting, but the clothes themselves are well-built and stand up to some substantial abuse. Comfort: 4. Ex Officio has the neat little added things that well-designed clothes should have like the buttons to hold rolled sleeves up, travel pockets to conceal passports, etc. Most of their fabrics are meant to also keep the sun off, so are made of light colors and thin fabric that work well in the heat. Price: $$$. If you’re in the market for specialty clothing, they’re on the upper end of similar clothing as are all Ex Officio products. But they’re the only ones who offer insect resistance, so in some ways, there’s no comparison. You can protect most of your body from bug bites with insect repellent clothing but I also bring Insect Shield Bandana for my neck. Our newer version of the clothing is guaranteed for 75 washes, which is considered the standard lifetime of a garment, as the people at Insect Shield have improved their treatment process.